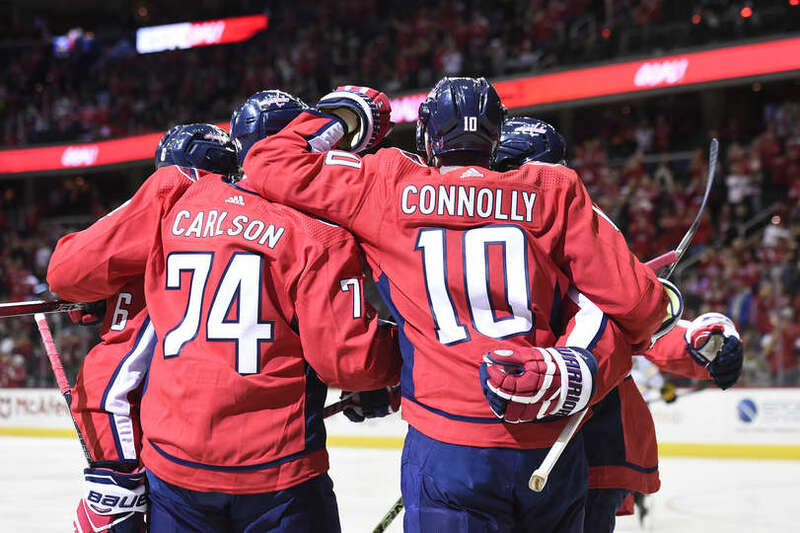 The Washington Capitals beat the Buffalo Sabres 4-3 (SO) Saturday night at Capital One Arena. The win improves the Capitals record to 20-9-3 (43 points). The Capitals are now off until Wednesday when they host the Pittsburgh Penguins at Capital One Arena. Puck drop is 8:00PM. Scratches: Andre Burakovsky, Dmitrij Jaskin and Tyler Lewington. The Capitals recalled Lewington earlier in the day. The Sabres would strike first with a goal from Jack Eichel at 2:41 of the first period. But the Caps would strike back. Brett Connolly would pot his seventh goal of the season at 3:39 for the 1-1 tie. Devante Smith-Pelly would make a nice play below the goal line, and find Brett Connolly camping on the doorstep for the easy finish. Devante Smith-Pelly was credited with the lone assist. The Capitals would stretch their lead to 2-1 with a goal from Jakub Vrana at 8:41 of the opening frame. Evgeny Kuznetsov was credited with the lone assist. The goal was Vrana’s 10th of the season. The period would end with the Capitals holding on to a 2-1 lead. The Caps outshot the Sabres 10-8 for the first 20 minutes. The Capitals out-attempted the Sabres 19-16 for the first period. The Sabres would tie the game early in the middle frame with a power play goal from Jack Eichel, his second of the game, at 2:25 of the second period. Eichel would split Nic Dowd and Dmitri Orlov for the close range snipe. The Sabres would retake the lead with a power play goal from Rasmus Dahlin at 7:21 of the second period, giving the Sabres a 3-2 lead. The Capitals would tie the game with a blistering rocket from Alex Ovechkin at 13:46 of the second period. Nicklas Backstrom and Dmitry Orlov were credited with the helpers. The period would end with the game tied 3-3. The Capitals outshot the Sabres 15-9 in the middle frame, and 25-17 after two periods. The Sabres were 2 for 3 and the Capitals 0 for 3 on the power play after 40 minutes of play. The Capitals and Sabres remained tied 3-3 at the end of regulation. The Capitals outshot the Sabres 10-4 in the final frame. The overtime would also go scoreless. The Capitals would win it in the shootout with scores from Kuznetsov and Ovechkin. The Capitals outshot the Sabres 38-28. The Capitals won the battle at the dot 53-47%. Alex Ovechkin’s six game goal streak is one shy of matching his career high streak set as a rookie in 2005-06 (Feb. 10 – March 8, 2006: 8 goals in 7 games). He has recorded a point in 14 straight games (17g, 6a), the longest point streak of his career (previously 13 games, Dec. 30, 2006 through Feb. 1, 2007, 20 points). This entry was posted in News and tagged Alex Ovechkin, Brett Connolly, Buffalo Sabres, Jakub Vrana, Jon Sorensen, Washington Capitals. Bookmark the permalink.